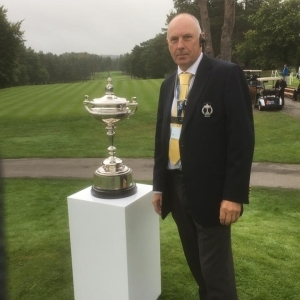 Club Professional Nic Gilks began his career at Edgbaston Golf Club in Birmingham in 1976, as Assistant Professional to Neil Selwyn-Smith. In 1979 he moved to Tamworth Municipal Golf Course, where he remained for a further 3 years, until being appointed Head Professional at Market Harborough Golf Club in Leicestershire, in 1982. During his time there, he twice won the Leicestershire county championship and several other county titles. In 1990 he moved to Nuneaton Golf Club and a year later, moved north east to Eaglescliffe Golf Club in Teesside, where he became coach to the Durham Ladies golf team. In 1995, he realised the opportunity to own and manage the course here at Bramcote Waters. During his time here, his career took a new path as he became a golf referee. He joined the PGA rules panel in 2000 and successfully passed the R&A rules exam in 2007. Nic has refereed at over a hundred events, including the Welsh and Irish Open’s and the Alfred Dunhill Links Championship on the European Tour. He has also refereed on the Ladies Tour, Challenge Tour and Seniors Tour. In 2014 he was at Royal Birkdale for the Ricoh Women’s British Open won by Mo Martin. In 2011 he refereed at the final Major of the year, the USPGA Championship, held at the Atlanta Golf and Country Club, in Georgia, and won after a playoff, by Keegan Bradley. For more information on how you can benefit from Nic’s years of experience as a Golf Coach, please contact him via the shop here at Bramcote Waters Golf Club.